Are you anxious about money? Do you sit up at night wondering how you’re going to pay the bills, drag yourself back into work, or retire? At one point or another we’ve all been there. 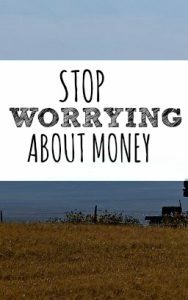 However, worrying about money day and night is extremely unhealthy and you need to do put a stop to it. What is making you so anxious? If you’re always worrying then I’m sure you already know the answer to this question. Pull out a notebook and pen and write down everything you’re worried about. Get those worries out of your head and out on paper, then you can move on to the next step. Once you know the problem you can make a plan. The reality is that 90% of the time the worrying we do is completely unnecessary and totally irrational. But if you’re in the 10% with rational worries now is time to make a plan. Map out a plan. Do you need to make more money? Save more money? Cut back your expenses? Decide right now what you’re going to do to change your circumstances and commit yourself! Don’t make excuses either – you have the ability to change your life. It won’t happen overnight but if you stick to the plan you WILL eventually find success. I am a worrier by nature. It’s how I’m wired and it’s something that I am aware of. The time you spend worrying is going to be much better spent improving your situation. If you’re strong enough to control your emotions (and I know you are!) then your next step is to take action. Work your plan. At the end of the day you are the only person who has the ability to change your life. Nobody else is going to do it for you. Accept your mistakes (because God knows we’ve all made plenty of mistakes) and move on. Stop being anxious about money and instead fix your situation. It might take months. It might take years. But in the end it will be completely worth it! I LOVE that quote. And I completely agree about the lack of understanding!